I received a rather lovely present from Mr M a couple of weeks ago - a fantastic book of images of Park Hill. Regular readers of my blog (and anyone who's familiar with my designs) will know that Park Hill features A LOT, so I was very excited to receive this book. 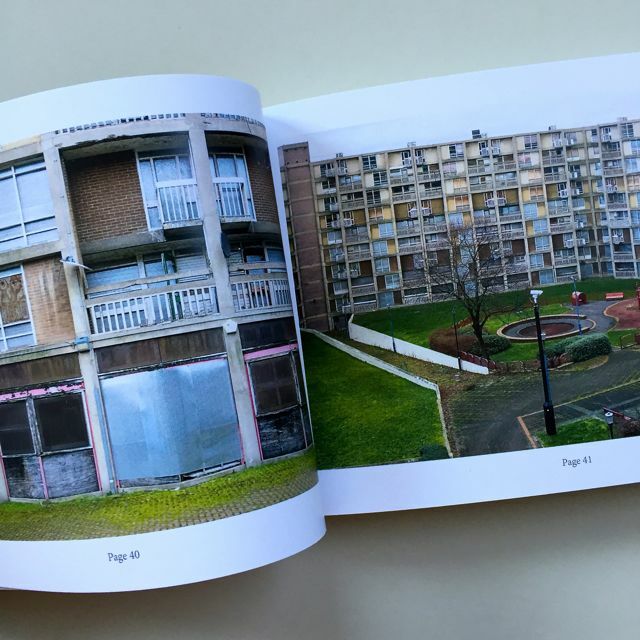 Streets in the Sky: A Dozen Perspectives features images from 12 photographers who all visited Park Hill on the same day (25 February 2015) and documented the flats from their own perspectives on that one day. There's a great mix of the old and new - the old derelict flats alongside the shiny new Urban Splash redevelopment. For those unfamiliar with Park Hill, it's a substantial post war development in the centre of Sheffield, built on the site of old slum dwellings, with the intention of changing the lives of those who used to live in these slums through the power of good design. The flats all face onto large walkways (wide enough for milk floats to drive around) from which the phrase Streets in the Sky originates. The development had it's own school, pub and shops and was intended to be it's own village within the city. As with so many of these post war Brutalist estates, it hit hard times in the 80s and 90s, almost becoming a no go area. Nowadays though it's on the up and Urban Splash have been redeveloping it for a few years (which just goes to show how huge the site is!). I keep meaning to have a look around myself, but haven't had the opportunity on recent visits to Sheffield - this book has really inspired me to make the effort though. I could keep flicking though it's 300 pages for hours. Streets in the Sky: A Dozen Perspectives is published by Future Heritage - you can find out more about the book, the photographers involved, and buy your own copy here.